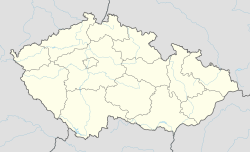 Hněvnice is a village and municipality (obec) in Plzeň-North District in the Plzeň Region of the Czech Republic. The municipality covers an area of 7.1 square kilometres (2.7 sq mi), and has a population of 108 (as at 3 July 2006). Hněvnice lies approximately 20 kilometres (12 mi) west of Plzeň and 103 km (64 mi) south-west of Prague. Wikimedia Commons has media related to Hněvnice. This Plzeň Region location article is a stub. You can help Wikipedia by expanding it. This page was last edited on 4 November 2017, at 15:06 (UTC).